Disabled people in the UK are "left behind in society" and have "very poor" life chances, a report has found. The study by the Equality and Human Rights Commission said progress towards equality in the past 20 years was "littered with missed opportunities." Chantal Chaervey, from Suffolk, said she was left "almost destitute" by the costs of caring for her disabled son. The government said it spends about £50bn a year to support disabled people. The report, "Being disabled in Britain: A journey less equal", covers six "key areas" - education, work, standard of living, health and care, justice and detention, and participation and identity. It found that disabled people in the UK were experiencing disadvantages in all of them. The report found a lack of equal opportunities in education and employment and barriers to access to transport, health services and housing. It highlighted a "persistent and widening" disability pay gap and deteriorating access to justice. Ms Chaervey, a single mother, feels she is not receiving enough support to make life better for her son Harry. The 14-year-old, who has multiple life-limiting conditions, needs round-the-clock care. Ms Chaervey cashed in the last of her pension pot five years ago to pay for essential equipment including a wheelchair, specialist buggy and stair lift. 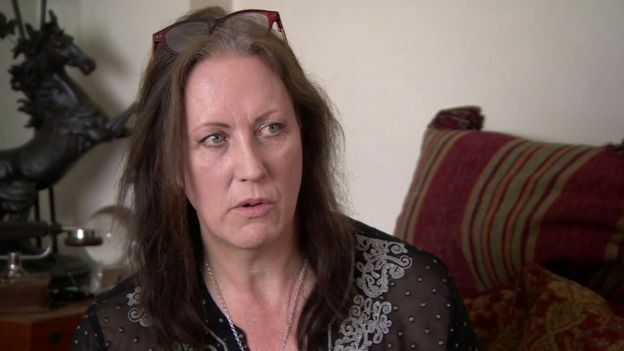 "I did have my own business, unfortunately I lost everything overnight because I had to care for Harry full time while he was in hospital for nearly 18 months," she said. "[It] left us almost destitute. "I now have debts, which I'll never be able to clear and I feel ashamed to say that." Disabled people were less likely to own their own home. Families in the UK with a disabled member were more likely to live in relative poverty than non-disabled families. David Isaac, EHRC chairman, said: "Everybody assumed the disability discrimination act moved things forward, but there's been a missed opportunity in relation to making progress since that period 20 years ago. "That's a huge period of time. "And, I think, progress has either stalled, or in some cases has gone backwards." He added: "Whilst at face value we have travelled far, in reality disabled people are being left behind in society, their life chances remain very poor, and public attitudes have changed very little." Andrew McDonald, chairman of disability charity Scope, said it was "shameful" that disabled people continued to face "such high levels of inequality". Liz Sayce, chief executive of Disability Rights UK, said the report made "sombre and disappointing" reading. A government spokesman said: "We are committed to building a fairer society, and ensuring equality of opportunity for disabled people is an important part of this. "In the last year alone almost 300,000 disabled people have moved into work, and we plan to go even further by providing more tailored employment help, increasing the number of disability employment advisors in jobcentres, and working even more closely with businesses through our Disability Confident scheme."